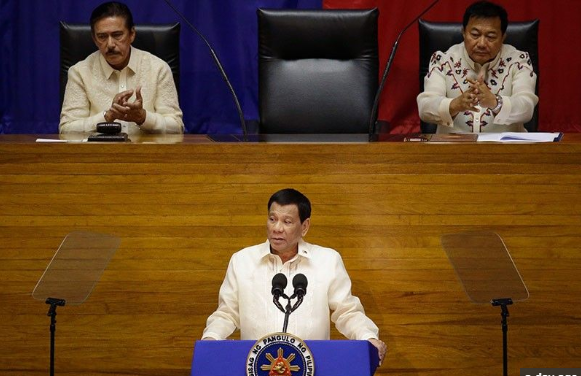 Manila, Philippines - Senate President Tito Sotto III disclosed that President Rodrigo Duterte nearly walked out after the leadership squabble at the House of Representative before the State of the Nation Address (SONA) on Monday. Sotto said that the row inside the House almost disrupted the chief executives’ SONA scheduled that day. Former President and now Pampanga Rep. Gloria Macapagal-Arroyo was installed as the new speaker of the House replacing Davao del Norte Rep. Pantaleon Alvarez– which happened less than an hour before the SONA. Arroyo and her allies voted to unseat Alvarez, however it happened without the House formally opening the session and without the mace on the floor. Alvarez, at that time, was with Sotto, who welcomed the president to the House of Representatives. Reportedly, when the president threatened to walk out, Majority Leader Rodolfo Fariñas reminded him that it was his constitutional mandate to deliver the SONA. Sotto, on the other hand, cleared that the President is not contesting Arroyo’s election as the new House speaker, because it was none of his business. “He said it’s none of his business, but they should not disrupt the SONA because it is mandated by the Constitution,” Sotto shared. If recalled, there were some changes with the scheduled speech of the president. Sotto said that the chief executive did not want to go out to the session hall without the problem being settled first. But after the president’s speech, the House resumed its session, where Arroyo won the support from 184 members and was installed as the new Speaker. However, from the opposition’s point of view, what happened at the House on the day of SONA was yet another reflection of the chaos and incompetence of the Duterte administration – said Senator Risa Hontiveros on Monday. “The debacle at the House of Representatives (HoR) that took place during President Rodrigo Duterte’s third State of the Nation Address (Sona) is yet another reflection of the chaos and incompetence plaguing the Duterte government,” Hontiveros said in a statement. “It reveals the extent of the President’s weakness, that minutes before his Sona, in front of the nation and the international community, congressional representatives decided to bicker and squabble for power,” she said. The squabble of House leadership had caused a delay of more than an hour. While, Arroyo reportedly skipped the president’s speech. “This is the true state of the nation,” she said. “It is petty infighting, backstabbing, and brinkmanship, all done at the people’s expense. This is nothing short of an embarrassment. It is a clear failure in leadership.” Hontiveros added.